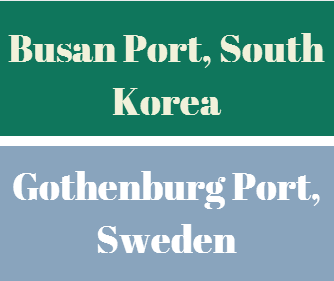 What is the transit time between Busan Port and Gothenburg Port? Port of Gothenburg is not one of the top 100 biggest container ports in the world, but it plays very important role in Sweden's international trade. "Sea transport is used for 90 per cent of the Sweden's imports and exports. Around a third of foreign trade passes through the Port of Gothenburg as it is the only port in Sweden with the capacity to receive the very largest ocean-going container vessels." "The fact is that every day every Swedish person touch something that has passed through the Port of Gothenburg." Busan Port is one of the biggest container ports in the world. It is the number 1 container port of South Korea and 5th biggest container port of the world by handling 17.6million TEU in 2013. How long does it take for a container vessel to come from Busan Port, South Korea to Gothenburg Port, Sweden? Today I would like to explain the transit time between Busan Port, South Korea and Gothenburg Port, Sweden. What is the transit time between Busan Port, South Korea and Gothenburg Port, Sweden via Maersk? 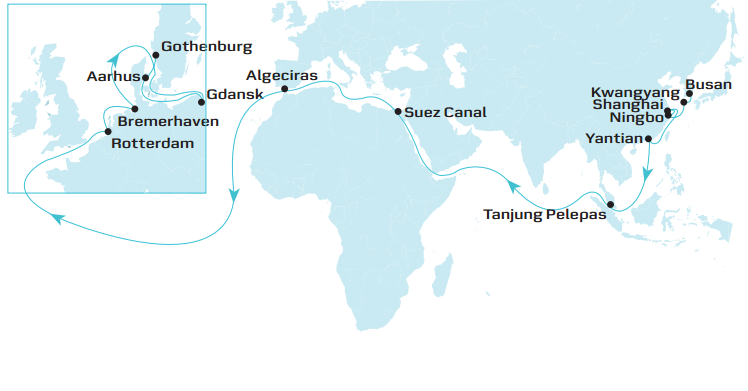 Maersk follows Busan Port, South Korea - Kwangyang Port, South Korea - Ningbo Port, China - Shanghai Port, China - Yantian Port, China - Tanjung Pelepas Port, Malaysia - Suez Canal, Egypt - Algeciras Port, Spain - Rotterdam Port, Netherlands - Bremerhaven Port, Germany - Gdansk Port, Poland - Aarhus Port, Denmark - Gothenburg Port, Sweden. The transit time between Busan Port, South Korea and Gothenburg Port, Sweden is around 42 days. What is the transit time between Busan Port, South Korea and Gothenburg Port, Sweden via UASC? 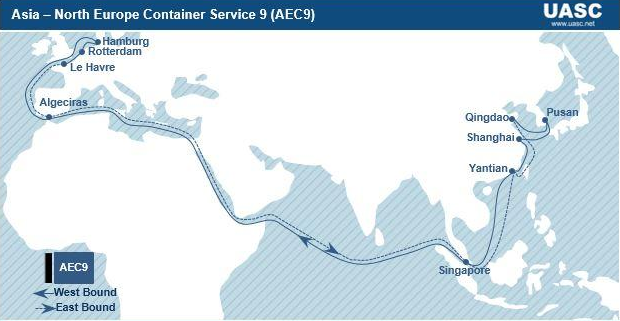 UASC follows Busan Port, South Korea - Shanghai Port, China - Yantian Port, China - Singapore Port, Singapore - Suez Canal, Egypt - Algeciras Port, Spain - Hamburg Port, Germany - Gothenburg Port, Sweden. The transit time between Busan Port, South Korea and Gothenburg Port, Sweden is around 39 days. What is the transit time between Busan Port, South Korea and Gothenburg Port, Sweden via HAPAG-LLYOD? HAPAG-LLOYD's transit time between Busan Port, South Korea and Gothenburg Port, Sweden changes between 39 days to 53 days.